Back when Welwyn Garden City had an Urban District Council this was their coat of arms, and very impressive it looked too. It was granted in December 1958. The shield was green, in keeping with the name Welwyn Garden City. The dividers allude to the planning of the town and form a “W” for Welwyn. The wheat ears refer to the original farm land on which the town was developed. The bees are symbolic of community living and working together as a social unit and have reference here to “garden workers”. They appear on a gold background for prosperity. 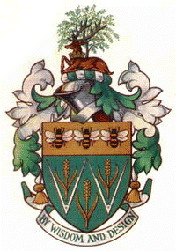 The willow tree on the crest recalls the meaning of the name Welwyn, and the hart and mural crown are from the Herts County Council arms. The town’s motto was, and maybe still is, “By Wisdom And Design”. This page was added on 09/08/2009.